Posted on September 12, 2016 at 11:44 am. Sign into your account at Leo Vegas between September7th and September 13th and make sure your account is funded with real cash. If you’re new to Leo Vegas, sign up here to take advantage of our exclusive new player welcome package where you’ll receive 200 free spins and a 200% matched deposit bonus. Leo offers plenty of safe, instant deposit options for AUD players including Visa, MasterCard, Neteller, Skrill and Paysafecard. Start playing Quickspin’s Sevens High pokies game for real money wagers. For every $7 you play through on Sevens High, you’ll receive one entry into the raffle draw for the iPhone 7 prize, where you could be one of seven lucky players to walk away with the new Apple smarphone. The seven winners of the Sevens High pokies draw will be announced after the promotional period ends on the 14th of September. Branch out from the pokies and take a seat at Leo Vegas’s exclusive live dealer Celebrity Blackjack Table. The first seven players to be dealt a pair of sevens during the promotional period will automatically win a new iPhone 7. 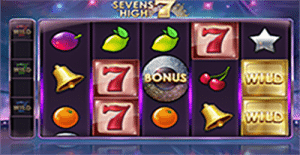 Sevens High is a five-reel pokies game that uses a classic slot format, which has been jazzed up for the new-age. In this game you’ll find all the traditional slot machine symbols, like liberty bells, lucky sevens, stars, cherries, plums, oranges and lemons, set against a bling-encrusted disco backdrop. The game comes with a lucrative re-spins feature as well as a free spins bonus, offering plenty of chances to boost your winnings. Remember, all it takes is playing through $7 on this game and an iPhone 7 could be yours – plus of course, you’ll keep any of your regular winnings made while playing Sevens High. Gameplay on all devices counts (desktop, laptop, smartphone and tablet) so you can start playing Sevens High from anywhere you can secure an Internet connection. Leo Vegas offers an award winning mobile casino, which is available via free downloadable app or in instant-play mode directly over your mobile Web browser. Along with Sevens High you’ll find hundreds of other mobile pokies to keep you entertained long after the iPhone 7 promo ends. Make a real money deposit at Leo Vegas Casino today and start playing Sevens High for your chance to win an iPhone 7. If you’re not in the market for a new phone, Leo Vegas is offering the alternative to redeem the iPhone 7 for a $600 cash prize.